Suitable for tracking any kind of physical object. You can create multiple asset databases containing any information you wish to keep track of. Some examples: put all your IT infrastructure into the database, or if you are a building manager, put all your facilities equipment in the database. This means that you can add or remove any columns from the database at any time. Each column can have whatever name you’d like to give it. Currently, columns can contain numbers, dates, free-form text, or drop-down lists (to be used if there are a range of valid items that could go into that field). 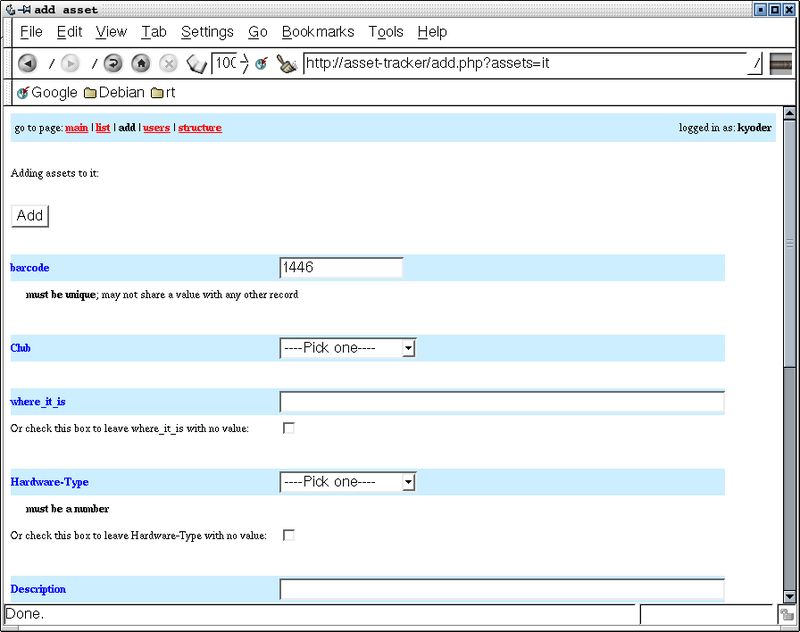 This allows you to decide who can view, add, modify, and delete items from any of the tables. The access control system is administered from within Asset Tracker. This allows you to choose only to see the data you want to see. For example, a facilities manager might want to see items that were installed 1 year ago, and whose expected lifetime is 365 days. This is easy to manage with the filtering interface. It becomes particularly powerful when coupled with external database connections such as RT2 (see above). 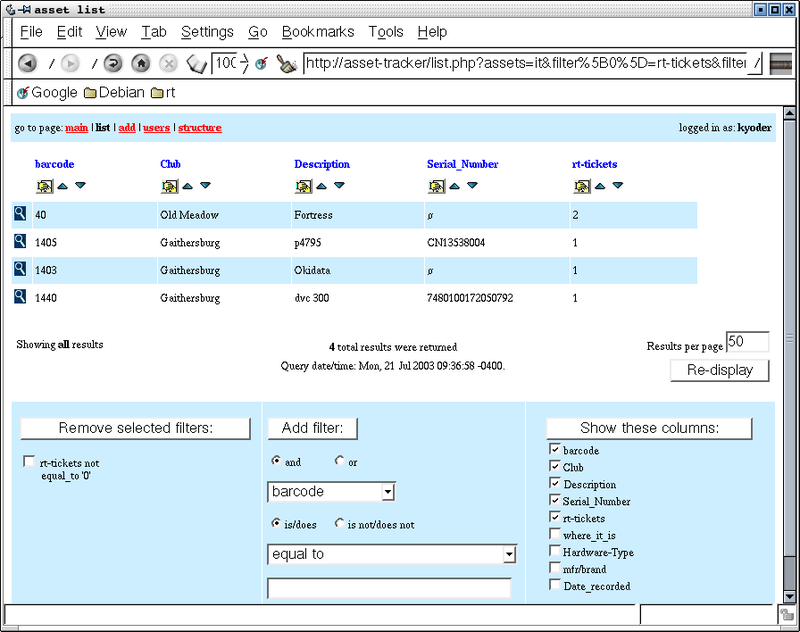 If a particular asset keeps generating repair orders within RT2, there will be a high number of RT2 links associated with the asset; this can easily be identified using the sorting and filtering interface. If you create a view with a particular sort order and filters, you can bookmark the search and return to it easily (of course, if the contents of the database change, the view will reflect the updated database). In fact, all operations within Asset Tracker are handled this way, so you can easily bring up any previous page or view. this application is very light 404K. extra space is necessary for the database.